TurboNick brings the universe of Nickelodeon to the Windows Vista platform. Using a remote control and an easy-to-use interface you can watch hundreds of videos, play games, take trivia challenges, rate videos, and be your own TV programmer. Developed business strategy, site priorities and managed teams to implement. Planned and reviewed site architecture for new web site products and features. Nickelodeon offered its premiere interactive broadband video destination, TurboNick, as the exclusive kids offering on the Windows Vista platform. Nickelodeon’s TurboNick offered a unique interactive experience with the best of Nickelodeon programming and games. The TurboNick launch on Media Center for Windows Vista took convergence to a new level as it was the first time users could experience TurboNick with the click of a remote on connected TVs. 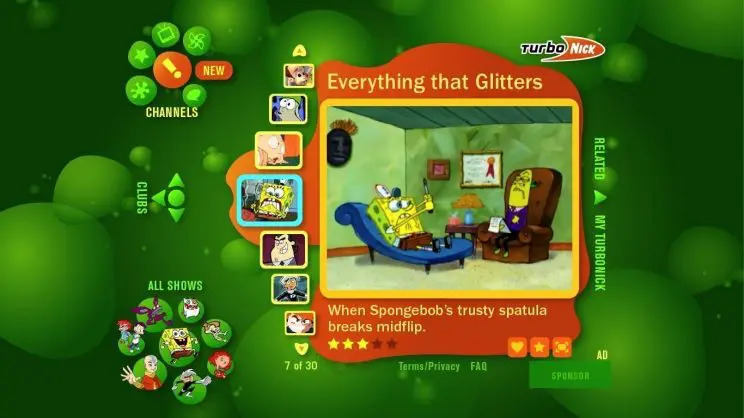 With TurboNick on Windows Vista, users were able to search through a massive video catalog of Nickelodeon content either by browsing the channels, shows or favorite Nickelodeon characters. Users could also create their own personalized playlists (“MySnags”), rate video content, take trivia challenges, or play games based on Nickelodeon property based content. Those consumers that had a video tuner cards for Media Center for Windows Vista could view Nickelodeon television live on their computer through TurboNick. Leveraging the full processing power of Windows Vista we aimed to create the highest fidelity and broadcast quality animations. This video demonstrates the various in application transitions and states.